Like an empty canvas, the blank taste of pasta allows for experimentation with flavours or paint, depending on the artist’s age. Draw upon wells of knowledge with today’s Groupon: for RM88, you get a three-hour pasta making workshop worth RM180 from Cooking With Nicholas in Petaling Jaya. Within spacious cooking commodes, pasta Padawans learn tips and tricks of lasagna and aglio olio creation from renowned chef, Nicholas Pillai, who will guide them through three informative hours. Ingredients and utensils are provided and apprentices will measure and prepare ingredients themselves and knowledge gained may be used to impress mates or incite jealousy. Hungry graduates should bring two containers to take home Italian goodness, while comfy clothes are a must to stretch pasta limbs and creative juices. Nicholas Pillai is currently doing a PhD. in Food and Culinary Management and is the co-author of Healthy Eating – Recipes for the Asian Palate. He has written for publications such as Her World, OH Magazine, Clove, websites such as Against The Grain and Pharmvision.com, as well as the Malaysian Women’s Weekly. He has also provided recipes for Rasa, Nur, Majalah Midi, Parenthink, Ibu dan Ayah, Traverama and Shape. I have never been a real fan of pasta, while I would eat it a little but I never crave for pasta, never once. I do use it as an alternative to rice at times as it does digest more easily but lately I have started to enjoy fresh pasta over dried boxed pasta. I think the flavor of the pasta is so different, that since doing my pasta class last year and having done 14 classes in one month and a bit, has changed my tastes towards fresh pasta over dried store bought pasta. I realized how awful store bought pasta was after making Aglio Olio for an order. While these clients regularly order this dish but after not having done it and doing all the fresh pasta classes I did, I just got a shock when I tasted it. Now I just cannot stomach boxed pasta anymore. I have tried it several times and it just did not seat well with me. I’m not being difficult or anything like that but this happens to be the case at the moment. As most of you who are regulars here know I am quite seasonal. Also I did a rather nice twist to Pasta Aglio Olio the other day… I know it is rude to bastardize a food but my new take on pasta Aglio Olio was one with Salted Fish with Lemon Grass and Kaffir Leaves. It was the first to finish at our new years party and everyone was asking for more. They even wanted to know the brand of pasta I used because it was different. Well it was fresh pasta. Fresh pasta can be a pain to make, trust me, I have 100 students from the last class who would agree but the end result if done right is fabulous, and it will change you. It will even change the Italian restaurants you frequent. 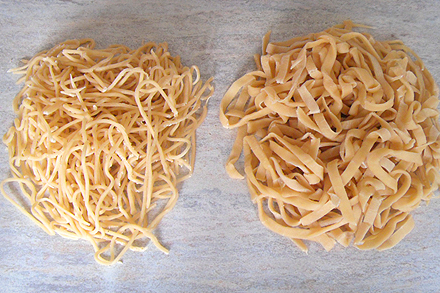 Boil Pasta till Al Dente – Wash through with cold water once it is done. Add in Garlic to sauté. 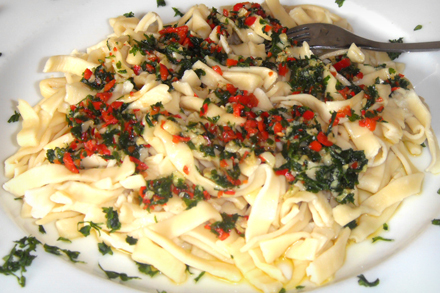 Stir in pasta, toss it around, and add in parsley and chilly. This New Year is all about me having to lose weight because of staying away from the gym for far too long. I just cannot seem to bring myself back to two years ago when I would be the first person at the gym each morning and also in the evening… Something is wrong.. so this month let’s start the ball rolling with something Vegetarian..It’s not often the most healthiest of options but let’s give it a try. 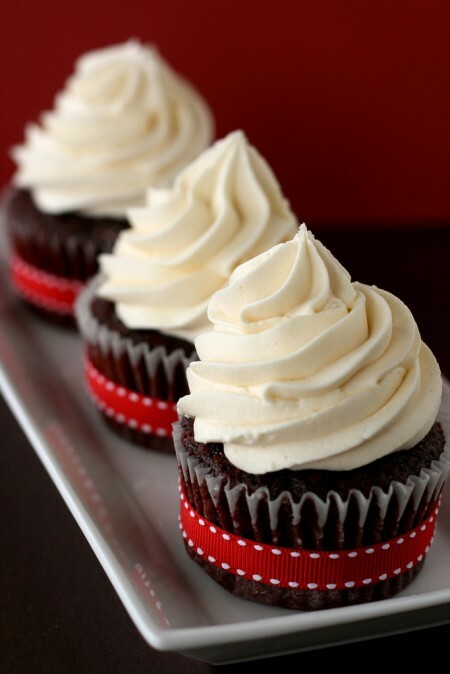 You will learn all three of the above and then pipe it over your cupcakes. There’s nothing like roast beef with Yorkshire Pudding. It was once a poor persons food but not anymore. Classes will be held at 70 Jalan 14/24 Petaling Jaya, Please check my blog, www.nicholaspillai.wordpress.com . Call 016 6827 465 or email nicholas_pillai@yahoo.com for details. If you have a group of 6 people or more interested in any particular class, please call me to book a day at least ONE week in advance.